The medicine is a combination therapy of antacid and anti-flatulent available in syrup or dry syrup suspension. 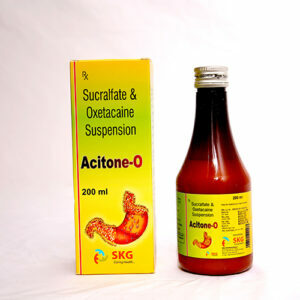 Simeticone is an over-the-counter (OTC) anti-foaming agent whereas Magaldrate is an antacid drug. It is used to treat many gastric related issues that cause fullness, painful pressure & bloating. The drug helps in changing the surface tension of the stomach and intestines gas bubbles. Gasses come together to allow passage for gas. Gastric problems or acid indigestion, gas, heartburn & sour stomach/ Intestine can be easily solved using this liquid preparation. The pH level of the stomach is increased and helps to break the gas bubbles. It can also be used to treat duodenal and gastric ulcers, esophagitis from gastroesophageal reflux etc.